When voters across Los Angeles County approved a half-cent sales tax seven years ago to ease traffic gridlock, the San Fernando Valley lost out to a lion’s share of new rail stops. Score: Greater Los Angeles south and east of the Santa Monica Mountains, 78. The San Fernando Valley, 2. That’s why Valley elected and business leaders are calling for a greater share of transportation fixes from a proposed extension of the Measure R tax and a fairer stake in a tandem transit tax proposal known as Measure R2. If both half-cent sales taxes make the November 2016 ballot, they could inject $121 billion for new people-moving projects for decades. The public drumbeat for more voter-approved transit money began early this year when mass transit boosters held a rally at the Van Nuys Civic Center to appeal to Valley voters for another tax. To win their support, they are having to address a shortcoming of bond Measure R, a 30-year half-cent sales tax that narrowly passed in 2008. Of its $52.4 billion in current Measure R budgeted projects, according to Metro, the Valley share was $2.5 billion — or 5 percent, while the Valley residents make up 15 percent of the county’s population and an estimated 23 percent of its tax base. And while nearly half of Los Angeles residents live within a quarter-mile of a regular bus stop, only 20 percent of Valley residents do. So when it comes to a proposed 1 cent sales tax for transportation upgrades, Valley leaders hope to see some serious local fixes. 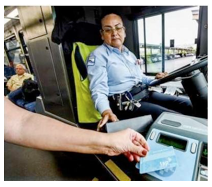 If Measure R2 is given the green light for the ballot box by the Los Angeles County Metropolitan Transportation Authority board, it may generate $75 billion over the course of 40 years. A renewal of the current transit tax could bring in another $46 billion in transit dollars. Half the combined $121 billion would be distributed to the region’s 88 cities for local transportation needs according to a formula based on local populations and jobs, Metro officials say. The other half would be dealt out to nine subregions, including the Valley, based on a limited list of transportation priorities submitted by nine local councils of government. Earlier this month, the San Fernando Valley Council of Governments submitted three transportation proposals to now cost $3.4 billion, which with inflation could cost $8.7 billion years down the road upon completion. • A light rail system to replace a slow and crowded Orange Line bus way. Cost, said Katz, a rail transportation expert: $1.5 billion. • A light rail system along a so-called East San Fernando Valley Corridor, a 9.2-mile link down Van Nuys Boulevard from the Sylmar Metrolink station to the Orange Line. Cost: $2 billion, or $450 million if employing bus rapid transit. • A light rail train tunnel through the Sepulveda Pass, to run 9 miles from the Orange Line to UCLA in Westwood. Designed to take traffic off the notoriously jammed 405 freeway, it could be combined (and partially paid for) with car toll lanes. Cost: $6 billion to $8 billion, or $1 billion for bus rapid transit. Metro officials say the Valley Council of Governments projects, as submitted, come to 15 percent of available Measure R project funds. The Metro board is expected to decide the criteria for the sales tax measure on Oct. 22, then review the projects and fine tune them over many months. Public hearings could take place next spring. If approved, the dual Measure R extension and Measure R2 half cent sales taxes would be submitted in July 2016 for a vote during the November presidential election. A two-thirds majority vote is needed to pass. Critics of the sales tax measures say when to build the proposed transit projects is almost as important as their initial funding. If a rail project is planned for the third decade, for instance, it may get superseded by inflation and other projects. And that’s what happened to the Sepulveda tunnel planned for Measure R, which is now in doldrums. They also say nearly 150 Valley transit projects proposed for Measure R2 were left off the table — from rapid bus lines, to rail links to Bob Hope Airport — with the three proposed rail projects gobbling up most of the funds. The Orange Line could first be speeded up by building grade-separate crossings, Katz said, that might cost $300 million and prepare the way for light rail. And while the proposed Measure R2 rail projects would do much to shuttle students to UCLA, they would do nothing to ferry students to Cal State Northridge, which now serves nearly 50,000 students and faculty without a nearby rail stop. A new partnership with Aclima will track air quality in L.A., San Francisco, and California's Central Valley. A Google Street View car equipped with Aclima air quality sensors, photographed in Denver in 2014. To make cities safer from air pollution, urban planners need to know exactly where the damaging particles originate and how they move through the air. A new partnership between Google and San Francisco-based air sensor company Aclima promises to collect that data and make it publicly available. Google Street View cars equipped with Aclima mobile air sensors will map pollution at the neighborhood level in Los Angeles, San Francisco, and California’s Central Valley, Aclima CEO and co-founder Davida Herzl announced at the Clinton Global Initiative on Monday. The resulting data will appear on Google Earth Engine for scientists to examine, while everyone will be able to track environmental health where they live through street-level air pollution maps on Google Earth and Google Maps. The project is already underway in San Francisco and is set to expand in 2016. That information is especially needed in the places Aclima and Google chose for the pilot. Those California regions rank among the American cities most polluted by particulate matter, which scientists have linked to heart disease, lung disease, and premature deaths (L.A. and the Central Valley are heavyweights on the list of ozone pollution, too). Air pollution annually kills approximately 3.3 million people worldwide, and 55,000 in the U.S. alone. The EPA operates stationary air sensors throughout the country to monitor background air quality for compliance with the Clean Air Act. These expensive and reliable tools don’t have much to say about variations in on-the-ground air quality from street to street and neighborhood to neighborhood. That’s where portable air sensors come in: a new generation of cheaper and smaller sensor technology allows users to track air quality as they move through their days and transmit the data to crowdsourced online databases. Moving away from authoritative government data sources opens up a set of reliability concerns. It’s hard to know whether a given unofficial sensor is accurate, or if different people’s sensors are calibrated to each other. The Aclima-Google partnership, though, brings the credibility of those two companies to the table—promising to generate more granular data than the EPA sensors, but with more consistency and reliability than crowdsourcing. Aclima collaborated with Google Street View cars in Denver last year to calibrate the sensors. They collected mobile readings throughout the city, then worked with the EPA to cross-check them with the official government sensors in the area. Having passed that test, the company is ready to scale up the operation. Google will provide free public access to these data. Scientists can delve into Google Earth Engine’s geospatial analysis tools to overlay air quality readings with years of archived satellite imagery, for instance, seeing how changes in land use relate to present-day pollution. Herzl is particularly excited about the ability to merge public health datasets with new geotagged readings of particulate matter and other pollutants. “This will really be the first time that we’ll be able to connect these two datasets at scale,” Herzl says. The information could drive public policy at the local level, Google Earth Outreach Program Manager Karin Tuxen-Bettman said at a press conference following the announcement. If city governments knew where the dirtiest intersections were, for instance, they could plant buffers of trees to keep fumes away from children playing on a nearby playground. The pollution maps can also inform casual observers on very simple lifestyle choices. We’ll have to wait to see how this commitment turns out in practice, but highly granular street-level data on the pollutants that Californians inhale every day could play a huge role in smarter city design. A question as important as whether a new school location is going to damage its students lungs should not be left up to chance. Even if you never set foot on a bus or a train, chances are transit is saving you time and money. The most obvious reason is that transit keeps cars off the road, but the full explanation is both less intuitive and more profound: Transit shrinks distances between destinations, putting everything within closer reach. A new study published by the Transportation Research Board quantifies the spatial impact of transit in new ways [PDF]. Without transit, the researchers found, American cities would take up 37 percent more space. 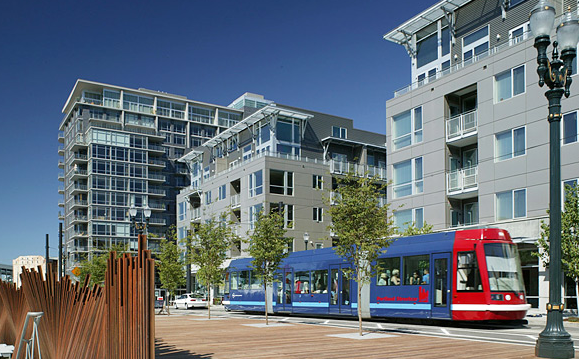 Transit-oriented development in Portland’s Pearl District. The research team from New York, San Francisco, and Salt Lake City modeled not just how many driving miles are directly averted by people riding transit, but how the availability of transit affects the way we build cities. By allowing urban areas to be built more compactly, the “land use effect” of transit reduces driving much more than the substitution of car trips with transit trips. Total miles driven in American cities would be 8 percent higher without the land use effect of transit, the researchers concluded, compared to 2 percent higher if you forced everyone who rides transit to drive. On average, the study found, the “land use effect” of transit is four times greater than the “ridership effect,” or the substitution of car trips with transit trips. But the land use effect of transit varies a great deal across urban areas, the study found. In places like Greenville, South Carolina, it’s responsible for reducing driving 3 percent. In San Francisco and New York City, it’s 18 and 19 percent, respectively. The authors suggest their model can help assess the effect of transit investments on travel behavior with greater sophistication. For example, adding a rail station to a neighborhood without one increased the density of jobs and residences by 9 percent within a one-mile radius, the study found. That would reduce driving about 2 percent for all the households across the area. In addition to new infrastructure, increasing the frequency of transit service reduces traffic too. The researchers estimate that a 1 percent increase in transit frequency across a region would be expected to bring about a 0.045 percent decrease in miles driven. And a 1 percent increase in route density — a measure of how many transit lines service a given area — would be expected to produce a 0.047 percent reduction in traffic. The report includes a “Land Use Benefit Calculator” [XLS] to help determine the total environmental benefits of transit projects. This week: ride, run, and plan for the future of Los Angeles – plus some great film screenings! No L.A. City Council meetings this week, due to a late September recess. Tuesday 8/29 – “#IAmPlanning: Bridging the Gap Between Planning and Activism” takes place from 6:30 to 8:30 p.m. at Mercado La Paloma at 3655 S Grand Ave in South L.A. It is free, but RSVP required at Brown Paper Tickets. Additional details at Facebook event. Thursday 9/1 – Community Services Unlimited hosts a film screening, panel, and reception as part of the art exhibit Urban Visions: Art a Social Practice. The free event takes place from 6 to 8 p.m. at USC’s School of Cinematic Arts Gallery. Details at Facebook event. Saturday 10/3 – Boyle Heights 5K Run/Walk & Munchkin Fun Run takes off from the Mariachi Avenue Gold Line Station at 8 a.m. Registration details at Facebook event. Saturday 10/3 – UCLA Transportation Camp takes place from 9 a.m. to 6:30 p.m. – but it’s sold out. Register for the wait list for $25 at Eventbrite. Additional information at UCLA Institute of Transportation Studies. Saturday 10/3 – Wear pink to the free #wattsrockpink2 bike ride and health fair. Starts at 10 a.m. at Watts Labor Community Action Committee at 10950 S Central Ave. For more information, see Facebook event. Sunday 10/4 – Head to the free Hollywood Sign Summit walk. It’s a free, public walk through Beachwood Canyon and Griffith Park to the Hollywood Sign, starting at 9 a.m. from Beachwood Market at 2701 Belden Drive in Hollywood. Tour some popular viewing areas and paths to the sign. Event includes guest speakers and a discussion and mini-charrette on improving access to the sign and Griffith Park in general. For more information, see Facebook event. Sunday 10/4 – Free bike tune-up session hosted by BKOB/Ride On Bike Co-Op from 10 a.m. to 1 p.m. at Leimert Park. Details at Facebook event. Sunday 10/4 – The Ambulante Film Festival presents a free screening of the movie Bikes Vs. Cars at the L.A. River bowtie parcel near the 2 Freeway in Glassell Park. For details see Ambulante Festival. Feeder rides from San Fernando Valley hosted by CiclaValley, and from South L.A. hosted by BKOB/Ride On Bike Co-Op. If high-speed rail were available today, two-thirds (63%) of Americans are likely to use high-speed trains and this jumps to nearly seventy percent (67%) when respondents were informed of the costs and time saving benefits of high-speed rail service, according to a 2015 survey released by the American Public Transportation Association (APTA). 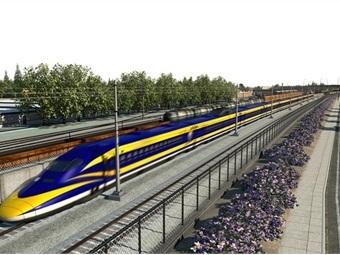 "People want high-speed rail in America and we are seeing support among various ages and in different regions of the country regardless of political party," said APTA President/ CEO Michael Melaniphy. "In addition, the millennial generation and younger adults will lead the way with their preferences to have a multi-modal transportation system that supports their lifestyle. It is critical that we include implementation of high-speed rail as we look to plan for the nation's future transportation needs." In the survey "High-Speed Rail in America 2015", conducted by TechnoMetrica for APTA, the likelihood of respondents using high-speed rail for their work and leisure travel increases as they were informed that it will be less expensive than flying and that it will take less time than driving to their destination. When told of these cost and time saving benefits, Millennials and young people (18 - 44) strong likelihood of use at 71% jumps to 76%. Those respondents who identify as Republican represent the largest growth of intended use, their likelihood of using high-speed rail increases from 58 to 65%, followed by Independents, 61 to 67%, and Democrats' already strong likelihood of use goes from 73 to 75% when informed of the savings of time and costs. "A high-speed rail network will have a tremendous benefit to our entire transportation system," said Melaniphy. "It will enable America's air, rail, bus, ferry and highway systems to each function effectively and efficiently as we face a dramatic population growth that adds more travelers than our current capacity can accommodate." The survey also revealed that Americans overwhelmingly support efforts to streamline government regulations that will promote real-estate development near high-speed rail. This development could include amenities such as popular retail shops, walkable neighborhoods, and unique dining experiences. Overall, nearly three quarters of respondents (71%) support reducing regulations so that amenities can be built near high-speed rail stations. "High-speed rail not only provides a great transportation option, but the public's interest in amenities near high-speed rail stations is another way to create economic growth and jobs in local communities across the country," said Melaniphy. "If we have strong investment in high-speed rail, it will be an opportunity to generate real-estate and land use income for the private sector as well as local tax revenue for communities for decades to come." High-Speed Rail in America 2015 survey was conducted by Techno Metrica for APTA. The survey includes 1,005 interviews using random digit dial sample of both landline and cell phone numbers. At the 95% confidence level, the margin of error for the respondents' overall sample is +/-3.2 percentage points. In the early 2000s, legal battles finally blocked a surface freeway extension across the 4.5-mile stretch where the I-710 was meant to connect to the I-210. This year, Caltrans and Los Angeles County Metropolitan Transportation Authority (Metro) released a draft EIR/EIS examining five other options, with Caltrans recommending an underground tunnel. But several cities—particularly those in the proposed tunnel’s path—say the era of building freeways is over, and that Metro should instead study sustainable, "complete street" alternatives that alleviate regional traffic while benefiting local communities. Glendale Mayor Ara Najarian—who serves on, and once chaired, the Metro board—co-chairs the Beyond the 710 coalition with South Pasadena City Council member Dr. Marina Khubesrian. In an interview with The Planning Report, they explained why they think a tunnel would be wrong for the area, and the benefits of a comprehensive "complete streets" solution instead. For Khubesrian, a physician, one crucial factor is community health: According to the Air Quality Management District, the tunnel project could raise the risk of cancer by almost 15 times. The area, Khubesrian says, is already chillingly known as "the cancer corridor." Additionally, the tunnel would cost several billion dollars, and cities worry it could become a drain on funding for other projects the region may need. Beyond the 710 worked with transportation consulting firm Nelson\Nygaard to develop an alternative proposal—one that costs $705 million, and which consultant Paul Moore says addresses numerous problems felt by residents throughout the area. The proposed bundle of solutions includes extending a Metro rail line, improving a north-south surface transit route, funding a regional bike plan, and taking steps to enhance pedestrian safety. As part of a strategy for travel demand management, it would subsidize transit passes for students in the corridor—which Moore says would eliminate more driving trips than the tunnel would carry. The debate in the San Gabriel Valley has become so heated that several cities—including Glendale, South Pasadena, Burbank, and Pasadena—are looking into leaving the area’s Council of Governments and forming a new alliance, to receive separate funding and make its own transportation decisions. "Communities most affected can’t just be one more vote in the decision-making process," he says. "They have to have a weighted and seriously accentuated voice… The stakes are much higher for cities and communities where projects are located. Decision-making cannot be based on a one-city-one-vote process." The Republican smackdown of federal high-speed rail funding was supposed to be the death of the national system of fast trains the White House envisioned early in President Obama’s first term. And yet cities across the country keep trying to make HSR happen. The latest example is XpressWest, the proposed bullet train between Las Vegas and Los Angeles. Last week project officials announced a new partnership with China Railway International, complete with $100 million in seed money, to “accelerate launch” of the line. The September 2016 target date to start construction seems ambitious, but given that the project’s environmental documents are already in order, it’s not outside the realm of possibility. If you’d given up much hope on XpressWest, you’re not alone. One insider tells CityLab the China Railway announcement caught even top Nevada officials by surprise. The project hadn’t made much noise since being denied a federal RRIF loan in June 2013 on the grounds that it violated the “Buy America” provision that encourages recipients to use parts manufactured in the U.S.—the obvious problem being that America doesn’t really have a high-speed rail industry at the moment. Therefore, venture backers indicated they intended to partner with foreign suppliers for the estimated 42 train sets they anticipate needing, with assembly being performed in southern Nevada. The Buy America provision was a tenuous reason to deny the RRIF loan in the first place—highway projects get relief from these requirements all the time. But if XpressWest truly makes plans to open a manufacturing plant in Nevada, the loan comes back on the table. Suddenly, the $5 billion or so that the project is expected to cost seems far less daunting. One more thing to keep in mind: the announcement is explicit about a rail line “connecting Las Vegas, Nevada to Los Angeles, California.” The inclusion of L.A. has been interpreted to mean Southern California broadly; after all, XpressWest is only cleared through Victorville. But consider that L.A. Metro and Caltrans have advanced plans in the works for a “High Desert Corridor” that will connect Victorville and Palmdale—with a preferred design alternative that involves running high-speed rail in the median of a freeway. Point being that with California high-speed rail slated to reach Palmdale, too, it’s not hard to see a single-seat ride from L.A. to L.V. emerging in the future. 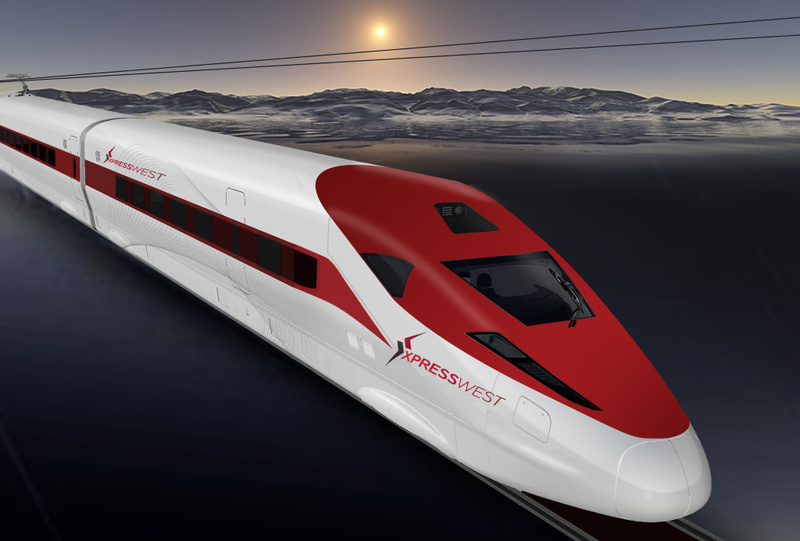 The XpressWest news is the latest example of how local officials and project coordinators have gotten fiscally creative in the absence of sustained federal funding for high-speed rail. California turned to cap-and-trade revenue. Florida is banking on value capture and real estate profits. Texas is insisting on private investors. Nothing is done yet, and plenty of U.S. HSR projects still haven’t identified any reliable source of funding at all. But planning continues to advance with the expectation that something will come along—as it has for the above ventures. Illinois is taking an incremental approach via “higher”-speed rail. Japan has offered to put up serious cash for a Baltimore-Washington train as a sort of advertisement for maglev technology. Parts of a Southeast rail corridor just got environmental approval, clearing the way to go knocking on wealthy doors. And the Northeast corridor remains the most viable HSR stretch in the U.S., especially if plans can be scaled back to fit more realistic funding expectations. In other words, the U.S. high-speed rail map, long left for dead, is actually coming into form—albeit slowly. There’s admittedly a great degree of uncertainty with all these projects; it’s quite possible many will fade away yet, and others will take many years to emerge. But it’s also possible we’re seeing the staggered, shadowy outlines of a new national transportation network in the making. Despite a solid case to be made for more federal high-speed rail funding, the sort of unified national vision that led to the Interstate Highway System probably isn’t coming through that door. But history reminds us that the interstates weren’t immaculately conceived by Eisenhower’s brain alone in 1956. Some toll roads later incorporated into the system were already being built out of a need—a need that U.S. intercity travelers stuck in highway traffic or on airport runways feel every day. Now that Mobility Plan 2035 has been voted into law by the city council, the bikelash bozos are prancing around again blowing their rubber-bulb horns and shouting out all kinds of invented “facts” (technically called “lies”) to support their contention that it’s impossible—impossible, I tell you!—to live any semblance of a normal life if bike lanes are striped and cars have to slow down to the speed limit. There are spurious claims that road diets will keep emergency vehicles from rushing to the scenes of the crashes that won’t happen as much anymore—yet it is cars that blockade firetrucks and ambulances right now; cyclists can pull off to the parking lane or even on to the sidewalk when the sirens howl. With road diets in place, there is more room for motorheads to get out of the way of serious drivers hurrying to save lives endangered by recreational drivers hurrying to show off. There’s the even more spurious claim that road diets will “kill business.” This one’s been debunked by actual real-world observation so many times that it hardly bears repeating that No, road diets are good for business. Its been proven over and over again. I can disprove that one myself: for over ten years, I did all the grocery shopping for a family of three, plus pets, by bicycle. I didn’t use a trailer, a cargo bike, or an e-bike either, just a normal everyday standard bicycle with two folding boxes attached to the rear rack. A full large bag of groceries in each one, and a big sack of potatoes or cat litter (or both) on top of the rack. Two trips a week to the supermarket, one to the Trader Joe’s. Easy enough. I still shop by bike, though less so now that I live a two-minute walk from two groceries. I’m not alone. Here are a few of the photos I’ve snapped recently of bikes parked in front of grocery stores. Yes, you can shop by bike. Tiny particles and troublesome gases in the outdoor air are ultimately responsible for some 3.3 million premature deaths annually, according to a comprehensive new look at the health effects of air pollution. The data suggest that globally, more people die from outdoor air pollution than from malaria and HIV/AIDS combined. And if there is no change to our current control measures, outdoor air pollution could cause around 6.6 million early deaths each year by 2050. “Air pollution appears to be a very significant source of premature mortality,” the study’s lead author, Jos Lelieveld of the Max Planck Institute for Chemistry, said this week in a telephone press conference. Low-altitude ozone and fine particulates in the air have been linked to heart disease, strokes, respiratory illnesses and lung cancer. But global data on this pollution has been lacking because air quality is not monitored in many parts of the world. Lelieveld’s team combined atmospheric modeling with population data and health statistics to create estimates of air pollution levels, where it was coming from and how many people it was killing. Particulates can come from natural sources such as dust as well as unnatural ones, including burning wood and charcoal, large-scale power generation, vehicles and agriculture. Agriculture may seem like an odd source of air pollution, but fertilizer and domesticated animals both produce ammonia, which mixes with other types of emissions in the atmosphere to produce particulates. The source of the particulates—and thus deaths from air pollution—varies from region to region, the study demonstrates. In the United States, for instance, where air pollution accounts for some 55,000 deaths annually, traffic and power generation are big contributors. In the eastern half of the country, the combination of agricultural fields and dense cities and suburbs combines to produce many deaths, Lelieveld says. But the majority of deaths from air pollution occur in China and India, mostly from residential heating and cooking, which is often inefficient and produces a lot of particle-filled smoke. Researchers already knew that this type of pollution, when breathed indoors, causes around 3.5 million deaths. But Lelieveld and his colleagues found this source is also a huge contributor to outdoor air pollution, responsible for killing another million people globally. “You cannot stop people from eating and cooking, but you can provide better technologies,” Lelieveld said during the press conference. He noted, however, that though inventors have tried to lessen this source of pollution with more efficient cookstoves, it has often been difficult to convince people to give up their traditional methods. Lelieveld admits that his group’s dataset is not perfect. For instance, there is some research that shows that black carbon—the main component in soot—is worse than other types of particulates. If that is true, than the scope of deaths from various sources of air pollution would change. But Lelieveld and his team hope that their research will help guide governments in creating better control measures. Evidence that such measures can reduce deaths comes from another study published today in Nature Geoscience. Dominick Spracklen of the University of Leeds and colleagues looked at the health impact from a reduction in fires linked to Amazon deforestation. They estimate that fewer fires lessened airborne particulates enough to prevent some 400 to 1,700 premature deaths in South America each year. Are megaprojects worth the money? It is often said that the defining feature of humans – what separates humanity from the animal kingdom – is our manipulation and mastery over nature. Since the Neolithic revolution and the start of history, humans have, to varying degrees of success, attempted to re-craft the environment to their own ends, rather than be subject to the whims of nature. From the Bible designating the earth as man’s dominion, to Enlightenment authors such as Sir Francis Bacon encouraging humans to “put nature on the rack and extract her secrets”, the drive to control nature and gear it towards humanity’s ends has been a constant impulse. Around the world, this sentiment seems to remain, with governments and businesses engaging in large construction projects altering the Earth and the way we traverse it, from high-speed rail changing how humans travel, to audacious canals and dams harnessing the power of water. With the start of the 19th century and the inauguration of industrial society, reaching its apogee in the 20th century, this impulse reached dizzying heights, in both theory and practice. To support the needs of emerging mass industrial society, and encouraged by constant technological and scientific development, large infrastructure projects were built. Following the Civil War, America criss-crossed itself with rail tracks – at no small human and financial cost – allowing for the movement of people and goods across its vast expanse. This was soon copied by the Russian Empire, which in the late 19th century completed its own rail network from one end of its sixth of the world to the other. In the 20th century, from the deserts of the American West, to Ghana’s Lake Volta and further east to China’s Yangtze River, huge dams were constructed, manipulating the natural flow of water, with an eye on improving humanity’s lot, be it through regulating water supply or providing electricity. While the rhetorical flourish of earlier enthusiasts for such projects may now be absent, government bureaucrats with large plans and larger budgets, however, have not. We are, it seems, living in an age of the megaproject. First, it is worth outlining what exactly a megaproject is. The word itself seems self-explanatory: some sort of large-scale construction project. The term, however, is a discreet label. The word megaproject first appeared, according to the Merriam-Webster dictionary, in 1976. According to Bent Flyvbjerg in a paper for Oxford University entitled What You Should Know About Megaprojects and Why: An Overview, they can be described as “large-scale, complex ventures that typically cost $1bn or more, take many years to develop and build, involve multiple public and private stakeholders, are transformational, and impact millions of people”. One of the key characteristics of megaprojects, which the words of Zazurbin seems to have anticipated, is that they are they are transformational. They are ‘trait makers’ of a society or economy. As Flyvbjerg notes, “They are designed to ambitiously change the structure of society, as opposed to smaller and more conventional projects that are ‘trait taking’, that is, they fit into pre-existing structures and do not attempt to modify these.” Such projects are often viewed as infrastructure style projects, but can also include water and energy provision, industrial plants, space exploration, urban regeneration, as well as less material types such as IT systems. These projects, then, are said to be dominant in our age. Total megaproject spending is assessed at $6trn to $9trn per year, which amounts to eight percent of total world GDP. According to The Economist, we are living through the “biggest investment boom in history”, estimating infrastructure spending in emerging economies at £2.2trn ($3.44trn) annually between 2009 and 2018. Likewise, McKinsey Global Institute claims that global infrastructure spending will be $3.4trn per year between 2013 and 2030, which would amount to roughly four percent of global GDP. Alongside this, the amount spent is accelerating at break-neck speeds. Despite the rhetoric of industrialisation and modernisation that China’s Communist rulers espoused in the 20th century, “In the five years between 2004 and 2009, China spent more on infrastructure in real terms than during the entire 20th century, which is an increase in spending rate of a factor of 20.” Furthermore, China built as much length of high-speed rail track between 2005 and 2008 as Europe has in the past two decades. To demonstrate the large scale of megaproject spending, Flyvberg makes a comparison to US debt to China, which is often viewed as an important and potentially destabilising aspect of the world economy. Megaproject spending is “the equivalent of spending five to eight times the accumulated US debt to China, every year”. The criticism, however, seems to miss the point. If certain megaprojects are indeed intended to make certain countries politically more powerful on the world stage, the questions begs how this is intended to do so. Outside of defence projects, the answer seems to be by increasing the economic power of the country, be it through increased manufacturing, transport or trade capacity, through the construction of large scale ports, industrial zones or plants to meet industry energy requirements, or extensive rail and road networks. Whether a country sees these as part of a plan to strengthen their state or simply create economic growth, the result is the same: more jobs, more trade and faster transport for citizens. For most megaprojects to pay geopolitical dividends, they must surely first present economic dividends. One major problem with megaprojects is that they are notorious for their propensity to overrun in both completion and budgets. As Flyvberg notes, “Nine out of 10 such projects have cost overruns; overruns of up to 50 percent in real terms are common, over 50 percent are not uncommon”. 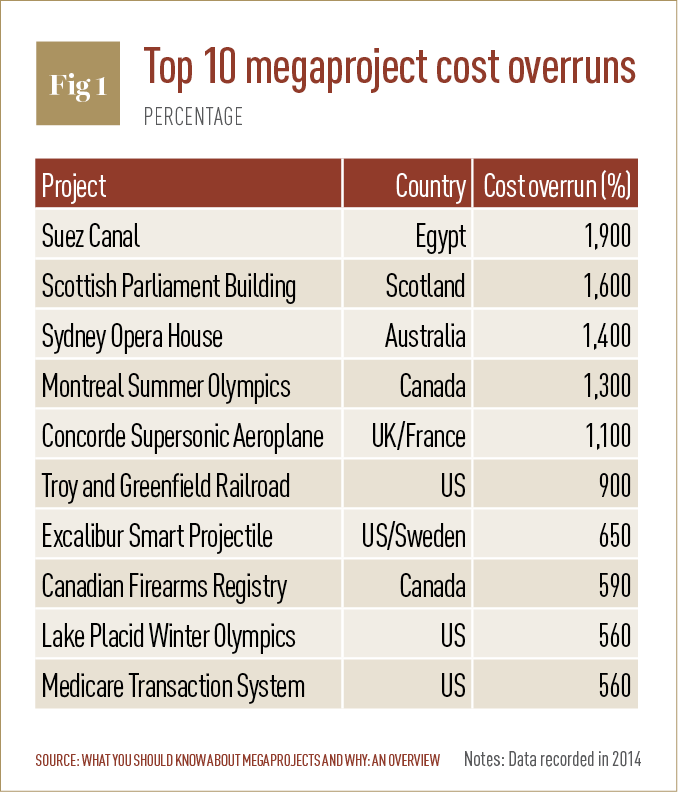 Many famous megaprojects have faced serious overruns (see Fig. 1). However, in a table provided by Flyvberg, nearly exclusively, with the exception of four projects out of 32 listed with the highest overrun costs, all are located in economically developed nations. Once reason for this could be that such countries typically face more stringent regulation, both environmental and social. Tough planning laws, greater legal recourse and denser population mean opposition from those living in areas affected by megaproject construction costlier, resulting in the need for high legal costs. Likewise, more stringent environmental regulations can often slow down construction, as well as adding to legal compliance costs. This suggests that overrun costs are not necessarily inherent to megaprojects, but rather to do with the political environment. European and North American countries have made a political decision – right or wrong – to enact legislation, which gives people legal recourse against megaproject constructions or various pieces of legislation. All of this amounts to extra costs in both direct terms but also in paying for legal experts to ensure all the rules are followed. 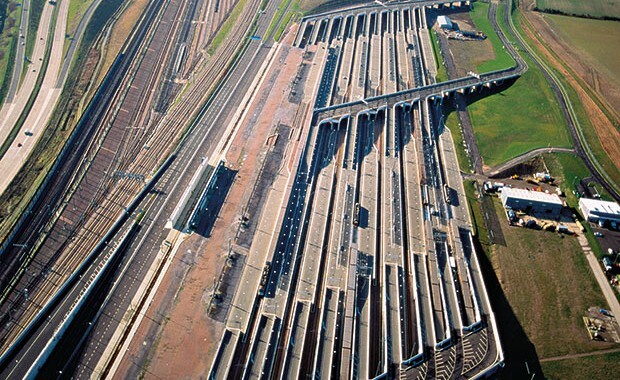 One case of such a project encountering overruns is the Channel Tunnel. The underwater tunnel connecting Britain and France was intended – and expected – to be profitable. The project, however, went 80 percent over budget for construction and 140 percent above for financing, while revenues have been 50 percent lower than expected. “The project has proved non-viable, with an internal rate of return on the investment that is negative, at minus 14.5 percent with a total loss to the British economy of $17.8bn; thus the Channel Tunnel detracts from the economy instead of adding to it”, wrote Flyvberg. Yet despite being a financial failure in terms of generating a profit, the Channel Tunnel can be seen as a success in other ways. As a piece of technological engineering it is impressive, being one of the largest underwater tunnels in the world. Both symbolically and practically, it connects the UK to the rest of Europe, allowing for passengers to quickly and easily cross the English Channel. Many major projects have been crippling overrun, yet we could not imagine the world economy without them. The Panama Canal overran by 200 percent, while Suez Canal in Egypt did so by an eye watering 1,900 percent – surely a great loss to all involved at time of construction. Yet these projects – as megaprojects are intended to be – were transformational. Panama, without its canal would surely not be home to one of the continent’s most impressive cities, Panama City, not to mention the obvious benefit of opening up a shipping route that cuts through the American continent. Likewise, by opening up shipping from the Mediterranean to the Indian Ocean, global trade without the Suez Canal seems unimaginable. Megaprojects are transformative for economies. While they often overrun, this seems to be a trend restricted to areas where regulation is stronger – pushing up costs. And overrunning on costs does not indicate a megaproject itself as a failure; trait-making as they are, they can provide long-run foundations for economic growth. Indeed, while the term megaproject is relatively new, any major industrialisation pursued by an economy – the only sure-fire way to address poverty – has either relied on such projects, for instance railway building, or on the creation of large planned industrial zones. In and of themselves megaprojects are vital to both address present poverty and ensure the world’s continued economic prosperity. A third rail line has been added underneath Ocean Boulevard in Long Beach, CA on Wednesday, September 16, 2015. Wednesday marked the completion of the nearly 3-year, $93 million Green Port Gateway project that saw the addition of 6 miles of new rail track laid around the Port of Long Beach. It's hoped that the project will reduce truck traffic and pollution with more cargo being moved by rail. Sounding train whistles, civic and harbor officials on Wednesday touted the completion of a three-year Port of Long Beach project that seeks to push more cargo on rail while eliminating the number of truck trips on the road. Paid in part with state and federal funds, the $93 million Green Port Gateway project solves a critical part of managing cargo growth for the nation’s second-busiest seaport by adding a third track on the southeast side of the port to ease bottlenecks, officials said. The new nearly 6-mile track near Ocean Boulevard serves the Long Beach Container Terminal, International Transportation Service and Pacific Container Terminal, which combined handle half of the cargo that flows through the port complex. The project also supports Middle Harbor, a new mega-terminal capable of handling 3 million container units and involved rebuilding part of Harbor Scenic Drive and 6,000 feet of retaining wall. “This Green Port Gateway rail project is a perfect example of the types of initiatives that the Port of Long Beach will be embarking on to ensure that we can move the cargo quickly,” said harbor commission board President Lori Ann Guzman. Officials also lauded the project’s environmental benefits, which include eliminating as many as 2.3 million truck trips and 300,000 tons of greenhouse gases. Trains put out one-third less greenhouse gases on a ton-mile basis compared with trucks, according to the port. “It’s a very, very aggressive project, but I’ll tell you, it is what drives all of the benefits of the environmental focus that we have here for the port,” Chief Executive Jon Slangerup said. The rail project allows the Port of Long Beach to meet its near-term goal of moving cargo by on-dock rail by 35 percent and eventually by 50 percent, Slangerup said. “(This) marks another big step as we build the port of the future here in Long Beach,” he said. Transit riders and walkers, who avoid the “unexpected delays” of traffic, stack up better in a new survey. There’s nothing quite like the unpredictability of traffic when it comes to commuter stress. This additional time budget indicates that they have, perhaps paradoxically, less control over their commute than commuters on other modes. Frequent and unpredictable occurrences require of them a peremptory stance toward their commute, where extra time becomes the best way to assure arriving to work or school on time. Drivers in the study budgeted an extra 21 minutes in travel time, on average, to deal with traffic congestion. They agreed more strongly than walkers or transit riders with the statement that “the only good thing about traveling is arriving at my destination”—suggesting they derive less enjoyment from the trip itself (perhaps they’d prefer to teleport?). Drivers also expressed stronger desires to commute more by walking or transit than either of those modes did about driving. Only a handful of previous studies have evaluated the relative stress of various commute modes. Some have found driving and riding transit to be equally stressful—and indeed, transit wasn’t far behind driving in the current study. Other results from the current study fell in line with related research: longer commutes were more stressful commutes, and active commuters (in this case, just pedestrians, as there weren’t enough cyclists to include) tended to be more satisfied with their trip. The new work also tried to identify certain stressors specific to each mode. For drivers, predictability was the big problem. Transit riders (subway, train, and bus alike) had their own predictability issues; transfers were associated with more stress, as were wait times—a stressor that speaks to the psychological power of real-time arrival screens. Pedestrians were the “least stressed mode group,” with feeling safe from car traffic their biggest concern. Active transportation modes are not only environmentally and socially more sustainable, they are also a less stressful way to travel. On[e] way to increase pedestrian mode-share is to protect walkers from traffic and provide more pleasant and more comfortable streets to walk on. Furthermore, public transportation is also less stressful than driving, which is found to involve (somewhat perversely) less control for commuters. Increasing the predictability and range of transit options in an era of increasing driving unpredictability could lead to a greater transit mode share. That last line is key. Driving might be the most stressful commute mode, but it often remains the most common one out of necessity. When there’s a reliable alternative, however, commuters respond accordingly—in the current study sample, 54 percent rode transit and 29 percent walked, with only 17 percent driving to work. Push for bike lanes on Central Avenue! Plus Vision Zero, Metro board, Marqueece Harris-Dawson’s South L.A. listening tour, North Hollywood re-development, an EYCEJ art exhibit focused on the L.A. River, and more! Wednesday 9/23 – The USC School of Cinematic Arts Gallery hosts a 4 to 6 p.m. opening reception for “Urban Visions: Art as Social Practice.” Details at Facebook event. Wednesday 9/23 – TRUST South L.A., Community Heath Councils, and Ride On! (bike co-op) are hosting a safety pit stop and press conference on Central Avenue at Vernon at 6 p.m. From their flyer: “Come out and support the implementation of a bicycle lane on Central Avenue. Every day, bicycle riders risk their lives transporting themselves to and from work, school, grocery stores, and other important errands. Central Avenue has the highest number of bike riders on it in all of Los Angeles, averaging one bicycle rider per minute. Come out and support the Central Ave. bicycle lane!” Contact TRUST at 323.712.2371 for more information or Estuardo@trustsouthla.org. Wednesday 9/23 – Los Angeles City Councilmember Marqueece Harris-Dawson convenes a town hall as part of his Eighth District listening tour. The free event takes place at Algin Sutton Park at 8800 S Hoover Street in South Los Angeles. To RSVP contact Ansley Jean Jacques at ansley@cocosouthla.org or (323) 750-9087. Future meetings will include Green Meadows and Vermont Knolls. Details at Facebook event. Thursday 9/24 – Metro’s monthly board meeting takes place at 9 a.m. at Metro headquarters behind Union Station. Agenda includes approving the Call for Projects, a new Parking Ordinance, and plenty more. Thursday 9/24 - The LADOT and the Los Angeles Vision Zero Alliance host the public event, “What Does Vision Zero Mean for Los Angeles?,” featuring LADOT General Manager Seleta Reynolds and national Vision Zero Network Director Leah Shahum. It’s free, with plenty of bike valet, at L.A. City Hall from 7 to 8:30 p.m. Details and RSVP at L.A. Vision Zero Alliance. Thursday 9/24 – Metro hosts a community meeting for its North Hollywood parking expansion, with some development thrown in for good measure. The workshop takes place from 6 to 8 p.m. at the North Hollywood Amelia Earhart Regional Library at 5211 Tujunga Avenue in North Hollywood. Saturday 9/26 – Community Services Unlimited is hosting “Earth Day Every Day” from 10 a.m. to 2 p.m. at the Paul Robeson Center at 6569 S Vermont Ave in South Los Angeles. Come support the movement for Healthier Food Access in South L.A. by enjoying seasonal local produce, handmade small batch chocolates, gardening give aways, Chinese medicine consults, Chicana Apparel clothes, vendors, info booths, music, and more. Details at Facebook event. Saturday 9/26 – #ReclaimingTheLARiver. Youth from East Yard Communities for Environmental Justice will be presenting a photography and film exhibit focused on reclaiming the dignity and respect of the L.A. River for the South L.A. river communities. The films and photo exhibit will explore both the history and the potential of the river. All films and photography will be original work from EYCEJ Youth and will be used as a public comment tool to support CommunityAlternative7 for the 710 Fwy project. The exhibit will be held at the Maywood Riverfront Park (5000 Slauson Avenue in Maywood) from 6 to 9 p.m. Details about the event and feeder rides to it can be found here.